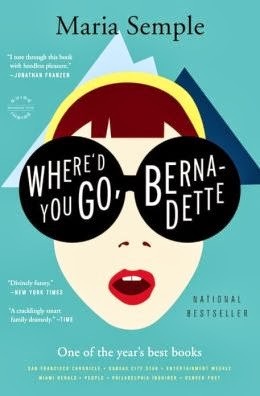 a book chick: "Where'd You Go, Bernadette"
my take: This read is as fun as its cover and title. It's mostly written in emails and faxes and that sort of document....which at first I thought was going to be tedious but was actually easy and entertaining. And, later in the story one discovers why. Part coming of age, part light mystery, part mid-life crisis this really has something for everyone. For me, reading it at the very end of summer (September) extended that beach read feeling into the school year. Some might call that denial ... I call it ingenuity. Make it last, people. Aspects I enjoyed: the 'gnats' of the school, how people aren't always what they seem to be, and it's never too late to figure out what one wants to be when one grows up. OWD: diverting. Oooh, just picked this for a book club at the end of the month and now really looking forward to starting it. Who knows how it will be for a discussion book, but since we're trying to re-start the RSA book club I thought I'd go for something lighter/shorter that perhaps more people would be interested int - glad to hear it fits that at least! And I'm about due for a fun read. I picture the mudslide often! I have given this book as a gift frequently. I haven't been to Seattle, that should change.